According to TMZ singer Ciara and her fiancé, NFL player Russell Wilson will be getting married by the weekend in England. The couple is currently in England with 100 of their close friends and family members. 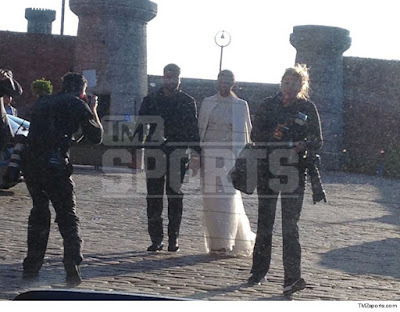 The photo above, which looks like they already got married, with Ciara wearing white, is supposedly a photo of the couple on their way to a pre-wedding dinner. Ciara supposedly had a bachelorette party in Vegas 2 weeks ago.